Yep, it’s that time of year where it seems sensible to reflect on what’s happened, and maybe set some goals for the year to come. With that said, don’t forget to keep reflecting during the year, and ground yourself to see where you are at, what you want to work on and readjust yourself if you aren’t going in the direction you hoped for. Or maybe a change in direction wasn’t what you planned, but is naturally the course you have taken due to a series of events. Either way, after a great Christmas and New Years break, I was able to reflect on the year that was 2017, and I’ve gone ahead and set myself some goals for 2018. It will be interesting to evaluate these during and at the end of the year to see what ended up happening. All in all, 2017 was a big one for me. A lot happened, life is never slow and the weeks soon turned in to months and next thing I know we were taking down the Christmas Tree once again. Given you’re here, let’s talk about the blog. I kicked off this blog at the start of 2016, and at that point in time I was still technically a Microsoft Systems Administrator at the local University and I had only just started focusing on the VMware and infrastructure realms. In 2017 I wanted to try to get 2 blog posts out a month, and I’m happy to say that I did achieve that, with a total of 25 posts for the 2017 calendar year. In 2017 I placed the website behind Cloudflare, which I cannot recommend enough, especially as they offer a free SSL certificate which took 5 minutes to configure. I also installed Jetpack in January 2017 as this seemed to be the go-to people are using for measuring site statistics. If people have better suggestions for a WordPress site, I’m all ears. I entered the Top vBlog 2017 event and managed to come in at a smooth 190! I actually was pretty happy with this for a first year and I didn’t advertise my site via any socials or at my workplace. There were 273 entries in total. I’m hoping to gain more exposure for sure in 2018 and it would be great to see that number get lower as I hope to make more connections and more importantly keep pushing content that is interesting and helpful to the community. I also signed up for Blogtober in 2017, which is aimed to set a goal for bloggers to get 5 or more posts out in the month of October. I had every intention of spreading this out, but I had a crazily busy first half of October. With that said, I was able to get 5 posts out by the end of the month, so I’m glad I entered and will be looking for similar challenges in 2018. The site statistics are interesting to reflect on. The image below is site views. While probably very low in comparison to the other 272 Top vBloggers, it was interesting to see I was able to increase month on month, with the exception of November (I didn’t put a post up in November) and December, which naturally tails off over the last two weeks. In 2017, I applied for and was lucky enough to be awarded with the VMware vExpert achievement. It’s a fantastic community to be a part of, and I haven’t even broken the surface of some of the benefits of being alongside other legends and experts in this community who put so much time in to helping and mentoring others. I’m about to re-apply for 2018 and hoping to make the cut, and I’m excited to see what opens up during 2018 via this programme. 2017 was my first full year working for a company based out of a different country, and with all but 1 customer being in a different state or country that I am located in. Add this in with attending conferences and team catch ups, naturally meant a bit of travel was involved. The graphics below summarise my travel for 2017. 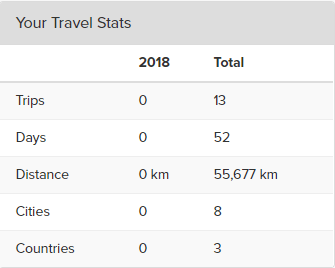 The ‘Total’ stats on the summary are correct for 2017, I couldn’t find where in TripIt to select a year, and I only started recording trips from 2017 anyway. I was away for 52 days in total, which ended up being 14.6% of they days in a year, or 22.1% of a working year (assuming 4 weeks of leave and 5 public holidays). Needless to say this is nowhere near what some of the people in our field do, especially those that end up on a lot of long haul flights, but it was a big jump from someone who used to fly 2 or 3 times a year. I expect the travel percentage to stay in the 20-30% realm for 2018. 2017 was a year of a lot of first for me, and one of those was the opportunity to attend VMworld 2017 US. It was also added in to my first long haul flight, first time in to USA and therefore the first time in to Las Vegas as well. I gave myself a few days before hand to have a look around (I landed on the Thursday before VMworld), but unfortunately I fell quite ill on the afternoon before leaving on a 27 hour door-to-door hike. I tried to naturally bounce back, but I had to resort to going to a walk in clinic on the Sunday to get some antibiotics. With that said, I did manage to see a small amount of Las Vegas over 3.5 days before the conference, and of course many a bar during the evenings after VMworld. The VMworld conference itself was absolutely fantastic. I attended the Hackathon on one of the Vester teams, and Wi-Fi issues aside it was still a great night to meet some industry superstars and meet some awesome people that made up the team I was on. I also was a last minute addition to the vBrownbag Tech Talks and managed to put together a short talk which I really enjoyed delivering, and again thanks to anyone that came along to attend and/or support me. There were a small bunch of us from Aus / New Zealand that caught up regularly, and I relied on some of the veterans to guide me along the way which was really appreciated. I’d still do some things differently, and with any luck I’ll be back there in 2018 or 2019 to do it all again. I’d love to see another city in USA apart from Las Vegas, but I wouldn’t say no to heading back in 2018 if offered! Another worthwhile mention for 2017 was the Melbourne VMUG UserCon, held in March 2017, which I was again lucky enough to attend. This was my favourite event I attended in Australia in 2017, with a rockstar lineup of international and local speakers and attendees, and hopefully I can be back there for at least Melbourne in March, if not Sydney as well (though, Melbourne is better guys!). And now to a few of my own goals for 2018. I’d like to speak at at least one event this year, hopefully more. It is a little harder being situated down in Tasmania, there aren’t really any local meetups down here like Powershell, VMUG, DevOps, etc. But the opportunities will present themselves, I just need to take them. Attending conferences were a big part of my 2017. At least for a Tasmanian! I think I attended 4 or 5 locally in ANZ, and 1 international (VMworld). I’d like to do the same amount, if not a couple more in 2018. There is a lot of value in meeting new people, keeping face-to-face touch with existing contacts and friends, and of course learning some of the new technologies and getting direct access to experts. If I can read 50% of the books I bought in the last 18 months, technical and non-technical, I’ll be happy. I buy a lot of eBooks in sales thinking “yep, I’ll read that”, and they just seem to sit there until I log in or trip over them again and completely forgot I bought them! Maybe it’s time to invest in a decent reader to use on the planes. I find myself easily consumed, especially in things related to IT, and often find myself forgetting what really is important in life – Family. There have been many posts on the work/life balance, but one I’d like to reference is from Anthony Spiteri around 18 months ago. This post resonated with many people, myself included. I continue to be unable to switch off, but I’d like to think I’m getting better. In the recent holiday period of 10 days, I think I spent around 6 hours on the computer which is a record for me. I was still heavily connected in on social media, and in 2017 I dropped my Facebook usage down a lot, to almost being non-existent. I’ve got a few goals of things I’d like to achieve with the wife and kids this year, so we’ll see how that goes. I’ve been an on and off guitar player for around 15 years now. More often off than on. In 2017 I don’t think I picked up a guitar. Not even once. It’s something I enjoy and I need to get back in to it. I’ve recently had my main 3 guitars cleaned, re set up and restrung. I got them back today, so I’m keen to ensure they get some use this year! This is one that I know a lot of people struggle with, and even more so in the IT field. With that said, there are also the fair share of very healthy and fir people working in this field, so there is no excuse. I’d say over the last 5 years, I’ve put on 3-5 kilograms per year. It’s time to fix that. I’d like to drop 10KG in 2018. If I drop 15KG, that’s worth a gold star. My initial aim is to go for a 30 minute walk for at least 5 days a week, but the biggest improvement I need to make is in what I consume. Especially when I travel. The challenge is on. I’ve made a lot of good friends in this industry simply through networking, and I’m sure there are many more out there to make. For personal and professional reasons, I hope to meet many new people across 2018 and with any luck I’ll be able to call a few of those people friends at the end of the year as well. That’s all from me. Have you had a chance to reflect on the past year and set yourselves some goals or challenges for 2018? No matter how big or small, make your first goal be to set yourself some goals!